Ringing, wobbling and singing – In 50+ year, I have rung at hundreds of different bell towers. Some of them move more than desirable in response to the force of the swinging bells, but this one really had to be seen to be believed. See the article. Thinking the unthinkable – Any community can get stuck with assumptions in a mental rut, and occasionally someone needs to 'think the unthinkable' in an attempt to break the mindset. The bellringing community faces several challenges in coming years, so I wrote a series of provocative articles for The Ringing World. I hope it will cause a few ripples, though it is a bit frustrating that the final article won't appear until well into 2011. See the articles. View from above – It is always pleasing to see how interested people are when shown the workings of English style ringing in a bell tower. I have organised many tower tours - most don't get recorded, but this one had an article written about it, since it was for the parishioners. See the article. At last – the new book – It has taken many years of hard work to produce, but finally it is published. The New Ringer's Book provides a comprehensive introduction to all aspects of ringing for the new ringer. It is available from Central Council Publications. The Human Factor – bridging the gap – I gave a paper at the Institute of Ergonomics & Human Factors annual conference. I always find that hearing about other people's work helps to blow away the mental cobwebs. This conference had the theme of 'bridging the gap' between researchers and practitioners, which is particularly apt in a discipline like ergonomics (aka Human Factors) which is about bridging the gap between people and the technology/environment with which they interact. See my summary of ergonomics. Another website – I just took over as webmaster for Sonning Deanery bellringers , and gave the website a much needed face lift. My aim was to make it easy to use, and to learn from other websites within the Oxford Diocesan Guild . Following the example of the Guild website, I added a history section – made easier by lifting material from my recent book . Remembering the grand old man – Having one of the giants of the bellringing world buried in your churchyard helps to give you a sense of history. So when it comes to the centenary of his death, it makes news. See the article. Entering the 3rd age? – We just joined Wokingham U3A . I was aware of U3A (University of the Third Age). I have given talks to several U3A groups, and they provide the biggest audiences of any groups I talk to. But I had no idea just how diverse U3A's activities were until now. The Wokingham group has around 1000 members and nearly 90 different activity groups. That should provide plenty of scope for new activities. After the event – It's odd how things seem to turn up out of the blue when it is just too late to take advantage of them. A couple of weeks after my book Living Heritage was printed I was cleaning out the bell chamber and found what I thought was a lump of iron in a cranny. I picked it up, turned it over and realised it was a bronze bearing block , which must have been lying there since 1958 when the bells were rehung on ball bearings, which I described in the book. Then this week, the heavy snow caused the large cedar tree in the church yard to lose many branches, one of which broke a gravestone. The grave is one of a pair that feature in the book, as does the tree, when it was small in 1910 at the funeral and when it is huge in modern times. It would have completed the story to show the latest pictures . My mother always said things come in threes. I wonder what will happen next. Two steps backward and one forward – The planning inspector's support for building 2500 houses on the southern edge of Wokingham brings the threat of destruction to the attractive area around Chapel Green and Ludgrove a step closer. Then over Christmas I saw a massive and prolonged spillage of diesel in the Emm Brook that runs through the area. But when the January snow brought most things grinding to a halt, I took my camera out to record this most attractive area in yet another guise. See the pictures. Publicity – Everyone who has read the book says how fascinating it is, and I got the same reaction from the audience at the talk that I gave last night. I've found this in previous talks – most people are amazed when they discover what is involved in ringing (or in this case in the history of ringing at Wokingham), because they had no idea before it was explained to them. They wrongly assumed that it was either boring or trivial (whereas it is neither). That gives me a dilemma: I am confident that lots of people will enjoy it when they read it, but I suspect that until they dip into it, they won't know what they are missing. It's a bit like Catch 22. I need find ways to trigger initial interest. Delivery of the book at last! – Finally, after four years research and writing, the copies of my new book arrived from the printer. All my previous books were published by CC Publications , so once I handed over the manuscript I could relax, but I published this one myself, so although the writing is over, the selling and promotion is only just beginning. Read the article about how I came to write it . The Godfather? – A couple of years ago I led a working group that developed the proposal what became The Ringing Foundation . I just attended one of its workshops, which was exploring ways to enhance the quality of training for ringers. (If you didn't realise that training ringers was an issue, see this explanation of ringing ). Some while ago, one of the Foundation's documents referred to the 'principles of its founding fathers', and someone joked that I must be The Godfather. There are some similarities though. Like a godfather, I have a keen interest in what The Foundation does. And like a godchild, it is an independent body that has to develop, and explore how to achieve its objectives. Ringing roots – We all feel the need to mark anniversaries with significant numbers. I long since passed my 50th birthday, but this year is 50 years since I learnt to ring. A celebratory peal seemed in order, but it had to be special in several ways. Read here. The new pealboard – Three years after the event, we finally commissioned a pealboard to record the first peal on the restored bells at All Saints Wokingham. This was a notable event, so the board was put on display to parishioners before being installed, and I wrote an article about the history of the other peal boards. Read here. More ringing music – After the talk on bellringing music (see below) I was asked to write a series of one page articles, which of course I did. Each article had to fit exactly a page, something I had plenty of practice doing when I wrote The Learning Curve , every month between June 1999 and December 2007. Roll up, roll up – This article, also about an aspect of ringing music, was written for ringers some while ago. Sadly some ringers aren't as aware of the musical aspect of their art as others. Read about 'roll ups' here . Public visibility – Some things are mostly heard and not seen, like tower bells. That's a pity, because people are normally fascinated when they do see them, and learn a bit more about them. At my tower, we hold periodic open days and group tours, but for all the time in between, and for the people who don't et a chance to see things in the flesh, I produced a coloured 3-fold leaflet, which is available at the back of the church, and also on the tower website. More public visibility – I ring regularly with a handbell group, and in conversation recently, mentioned that when I was an undergraduate, we used to ring handbells while punting on the river. See a picture of two of my friends (and my legs). What's boreing and under threat? – The spelling is deliberate – the Severn Bore, a spectacular natural phenomenon, will be a casualty if a barrage is built across the Severn to generate tidal power, which now looks likely with the Government approval of a study to identify the best scheme. I first saw the Severn Bore many years ago, and later took my children to see it. Future children may not have the chance. See pictures and article . You can't be serious! – Digging out my notes on the Severn Bore (see above) I came across details of the Rod-Stone-Fortnight system of units. If you think metrication is confusing, think again. This mad idea that we dreamt up in the late sixties is even worse. Read here . Success isn't guaranteed – Not in peal ringing anyway, which is a pity, since this one that we lost would have been the first for our youngest ringer. I was calling the peal, and when the conductor makes a mistake it can be terminal. Sadly you can't win them all. Read here. 800 years old and proud of it – 2009 marks 800 years for Cambridge University. The University suggested bells be rung to celebrate, and we responded, around the world. Read here . If you go down to the woods ... – OK, it's a corny title for an article about erecting the church's Christmas tree, but there is a tenuous link, as the article says. Anyway, it was an opportunity for readers to see the ringers in action performing a service that is normally invisible to them. Read here . 300 and counting – Passing a round number always makes you think. In this case, it was when I went home after ringing a quarter peal on All Saints Sunday, at my home tower of All Saints Wokingham , and saw it was the 300th quarter peal I had rung in the tower – more than half of the quarter peals that I have rung. If you aren't sure what a quarter peal is, see here . The previous day (Saturday) was All Saints day, for which we rang a (full) peal. Read the article I wrote . Music and ringing – Change ringing is a rather unusual form of music, and although many ringers are also interested in music, most musicians know hardly anything about ringing. Last week I was asked to talk to the annual meeting of the SouthEast region of Making Music (aka National Federation of Music Societies). The talk drew on what I have presented to many community groups , but with the musical aspects greatly expanded to include bell tuning, learning and performance skills, composition and conducting. 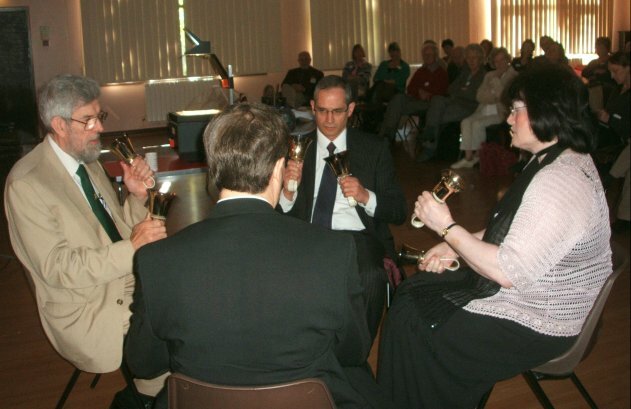 I included two performances of change ringing on handbells (with the help of three colleagues). The audience found it very interesting, most having previously had no idea how much there was to know about ringing. Read the article I wrote for The Ringing World . Wild flowers – Shortly after taking all the pictures of the walks south of Wokingham (see below) I discovered that a fellow RISC-OS user was setting up a website wild flower finder and was asking for contributions. After some exchanges, we managed to help each other. I had been unable to identify a persistent weed in my garden. He identified it as spreading yellow sorrel, of which he hadn't got any pictures, so I supplied some, and in return got my picture on his website as a contributor . Smoke and mirrors – OK, that's an exaggeration, but in a small way, a ringing simulator creates an illusion of reality that isn't there. This article was an appeal for someone to donate used laptops, for use as part of two new ringing simulators . But to do that, I had to explain what a simulator was. Read here . Living heritage – Heritage open days are mostly about letting people see historic buildings and artefacts (like our bell tower) but I wanted them to see the cultural history of ringing as well. So I am giving a public lecture in Wokingham Town Hall. This article explained what it was about . The answer is development – now what was the question again? – I took part in a workshop organised by the Council to involve the community in decisions about the future of Wokingham. It was an interesting day; we walked round the town, saw things we didn't know were there, and came up with quite a few useful ideas, See the pictures and also my views on the development. Changing horses – All good things come to an end, or so they say. After serving 15 years on the Education Committee of the Central Council of Church Bellringers , the last 8 as chairman, I decided it was time to stand down and make way for new blood. Not being one for an easy life though, at last week's Central Council meeting I stood for election to the Public Relations Committee . My first meeting is next week, and I wonder what I have let myself in for. It will be very different, but I am sure worthwhile. Ringing needs to be far better understood by the wider public. Most people have no idea of the rich cultural heritage of English style ringing, or the skills involved. All they have is a comic image of people pulling on ropes, which bears little relation to reality. In all my contact with non ringers (eg the talks that I give , or when they visit my home tower ) I find they are fascinated to discover just how much is involved – the mental and physical skills, the technical and historic aspects, and the fantastic sense of community that exists among ringers in this country and abroad. If you would like to know about ringing more, see About Ringing and History of Ringing . Making history – The last time I rang two peals in a day was when I was a student in a 1960s, and that was just a coincidence. This time was something special. Ringing a peal at both Wokingham towers on the same day is a feat not done for nearly a century. Six hours ringing on a very hot and humid day was rather sticky. Read here . I also wrote an article for The Ringing World, Read here . Ringing the changes in hand – at the end of the Branch skittles evening yesterday, we rang a couple of courses of Plain Bob Major on handbells. One of the ringers had brought some handbells 'in case needed' and having discovered that there were some experienced handbell ringers among those present, we made use of ringers' dinners , so non-ringers rarely get a chance to hear them. Invasion of the Harlequins – When one of our young ringers noticed clusters of ladybirds in the tower windows, we set about identifying them, only to discover that we had become the target of an alien invasion. Read here. Tribute to a friend – It is sad to hear of the death of someone you have known for a long time, but it can be uplifting when you reflect on what you have shared, and the value of the life now ended. I rang with Stewart Gibson for over twenty years, and shared with him the task of developing the band at All Saints WokinghamRead here. The last 'Learning Curve' – All good things must come to an end. After 102 monthly articles, the last Learning Curve (see below) appeared in The Ringing World on 7th December 2007. Volume 4 of the collected articles appeared shortly afterwards and all are available from Central Council Publications. Individual articles can be downloaded from the Central Council Education Committee website for training purposes. They aren't all there yet, just the more recent ones – another job to do. Penny plain, tuppence coloured – When I designed this site, I deliberately wanted to keep things simple. As a result, the home page was rather austere. I finally decided to change it with a new layout grouping the topics, a friendly colour, and thumbnail pictures to introduce the topics. Maybe I will give other pages a make-over in due course, but for now they remain focused on content. See the Home page. What is a simulator – When I added a site map for this site, I was at the same time was motivated to put some substance into the previously empty page about ringing simulators. Read here . It's nice to be appreciated – I keep getting good feedback about All Saints tower website. As well as kind words, people want to use pictures from it, or link their sites to it. First it was the webmaster of BellringingForums who used some of the pictures for his masthead, here . Then there was a message from someone in a church in the USA, who had found the site very useful, and wanted to link to it. Out from under the bushel – OK, it was a corny title, but the biblical allusion to not keeping your light under a bushel seemed appropriate. Most ringers are hidden from view, and as a result the public knows very little of the fascination and traditions of English-style bellringing. The article, first published in The Ringing World described what we did at All Saints Wokingham, with the hope of inspiring others to do the same. Read it here .